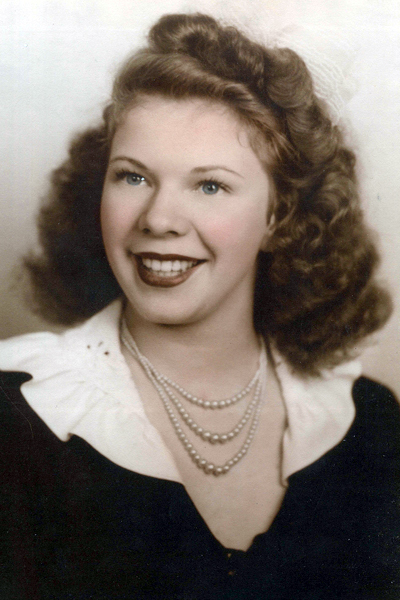 WARREN — Evelynmae S. Dennis, 90, entered into eternal life Friday, April 5, 2019, surrounded by her family. Evelyn was born July 9, 1928, in Warren, the daughter of Charles F. and Carrie Hood Snyder. She was a lifelong resident of Trumbull County, graduating from Warren G. Harding High School and Warren Business School. On Aug. 24, 1947, Evelyn married William H. Dennis at First United Methodist Church in Warren. Evelyn and Bill raised their family in Warren. Evelyn was a dedicated mother, acting as a room mother, taking kids to Scouts; and keeping love, order and harmony in a home with eight people and a multitude of pets. In later years, Evelyn earned her real estate license. Evelyn was a true original, a great wife, daughter, sister and wonderful mother — smart, loving, strong-willed, with a wonderful dry wit. She was always forthright, there was never any question as to who was in charge. Evelyn had an unwavering dedication to her children and brimmed with courage and determination; she was renowned for being small but mighty. Her family was most important and she often said that raising her six boys was her greatest joy and accomplishment. Evelyn’s indomitable spirit lives on in her children, grandchildren and great-grandchildren. “It is indeed a sure proof of their excellent education, when all the children of a family can arise and call their mother blessed. And when all are gathered in the circle of love, such a home presents the loveliest scene on earth.” (Ann Pratt). Besides her parents, Evelyn was preceded in death by her husband, William H. Dennis Sr. and son, Robert W.S. Dennis. Evelyn is survived by her sons, William H. (Mary) Dennis Jr., Charles L. (Luanne) Dennis, Richard R. Dennis, Douglas A. Dennis, James M. (Felice) Dennis Sr.; and her sister, Madeleine Y. (Arthur) Fallone; sister-in-law, Patricia (Norm) Silliman; her grandchildren, William H. (Christa) Dennis III, Bret R. (Lora) Dennis, Christopher R. Dennis, Noah A. (Sarah) Dennis, Matthew R. Dennis, Pauline R. (Nathan) Sylvester, Douglas C. (Eunbin Yu) Dennis, Lucas J. Dennis, Jennifer L. (Garett) Dennis, James M. (Stacey) Dennis Jr., Charles A. R. Dennis; and great-grandchildren, Meredith Dennis, Norah Dennis, Henry Dennis, Calvin Dennis, Hailey Dennis, Izabella Dennis, Luca Dennis, Addyson Dennis, Vincent Dennis, Jared Freeman, Scarlett Freeman; and nieces, Madeleine Allen, Evelyn Stubbs, Becky Scheeler; and nephews, David Silliman, Bill Silliman, Mark Silliman, Richard Silliman; and numerous great-nieces and great-nephews. The family would like to thank Dawn Whitmore, Evelyn’s caregiver. A private service was held and interment was made in Oakwood Cemetery. Contributions can be made to Trumbull Mobile Meals, 323 E. Market St., Warren, Ohio 44481, in her memory.